This study aimed to define the comprehensive bacterial flora of the healthy oral cavity by identifying and comparing bacterial species in different subgingival sites using 454 sequencing of 16S rRNA genes. Subgingival plaque samples were taken from six target teeth (central incisor, first premolar, and first molar in both the maxilla and mandible) of 10 periodontally healthy patients. Bacterial DNA was extracted and next-generation sequencing of 16S rRNA genes was performed. Bacterial composition in phylum level was similar for all sites within the same individual irrespective of tooth location. Unweighted UniFrac distance values of microbiome also showed that average distance was significantly larger between subjects than between tooth locations of the same subjects. The present results clarify the lack of effect of tooth location in the healthy subgingival microbiota. Results may suggest that any subgingival site can demonstrate similar subject-specific microbiota. This investigation offers a better understanding of the uniqueness of the oral microbiome. The present study will facilitate sampling in future subgingival microbiological studies. The online version of this article ( https://doi.org/10.1007/s00784-019-02805-3) contains supplementary material, which is available to authorized users. We thank Dr. Walter Meinzer for the critical reading of the manuscript. This study was funded by the Japan Society for the Promotion of Science KAKENHI (grant numbers 26463129 and 17K11981). 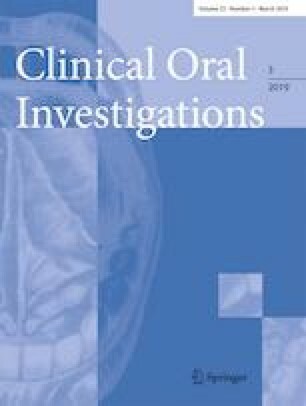 This study has been performed in accordance with the ethical standards of Tokyo Medical and Dental University Institutional Review Board (No.1138) and with the 1964 Helsinki declaration and its later amendments. Written informed consent was obtained from all enrolled individuals.